As we mark International Women's Day on March 8 in celebration of the rights, status, achievements, and potential of women in our society, Educate Lanka looked to its own impact to reflect upon its role in unleashing the potential of the deserving poor, specifically the women, through the weapon of education. Rashmi, a grade 10 student from Gampola, Sri Lanka, comes from a single-parent household. When Rashmi's father neglected the family, her mother, Sriyani, struggled financially to make ends meet. Though she could not fulfill her dream of a proper education, Sriyani was determined to give that opportunity to her daughter. Sriyani's resilience paved way for her to become a dairy-product entrepreneur. Today, she is grateful to Educate Lanka for having taken the financial burden of her daughter's education off her shoulders over the past four years. When we met Rashmi and Sriyani in January, Sriyani shared her gratitude with teary eyes: "I am grateful to Educate Lanka for giving my daughter the opportunity [to pursue an education] that I was not lucky to receive. I wish Educate Lanka existed 25 years ago so that I too could have fulfilled my dreams." With the inception of the country's free education system and compulsory primary education up to grade 9, Sri Lanka has boasted a 91.2 percent adult literacy rate and a 98.8 percent primary school enrollment rate, some of the highest stats in the region. These figures, however, mask the high student dropout rates, especially beyond grade 9, prominent among students from socio-economically deprived backgrounds. Among these children are thousands of promising students with the potential to be Sri Lanka's future leaders. Although a number of demand and supply-related factors contribute to this issue, poverty and cost of schooling have been the biggest impediments. Since poor families are unable to financially support their children through secondary and higher education, children from these families give up school in search for employment or household work. Most young girls who leave school either help with household chores and childcare within their families or earn an income by working in agriculture, as domestic maids, or in low-skill industries. Students from the North and East, areas that were under the war for nearly three decades, were severely affected by the conflict. They were forced out of school due to violence and displacements. Though the war ended in 2009, students from these areas continue to struggle to access education due to various socioeconomic hardships. Students need to overcome many socio-economic hardships to access quality education. Renuga, a 12th grade student from Omanthai, Vavuniya of the war-affected Northern Sri Lanka, received her scholarship in January this year when Educate Lanka extended its efforts to the region. For Renuga, who faced multiple displacements and violence during the war, the scholarship gives an opportunity to pursue her dreams. "The situation my family is in is wretched. I am continuing my studies after being affected by the war. There are seven people in my family, but [with the exception of me] none of them are continuing their studies and are staying at home due to poverty... I should look after my family... My wish is to become an art teacher... I am grateful to you and thank you for supporting my education and my life... may God be with you and your family," writes Renuga appreciatively to her sponsor. 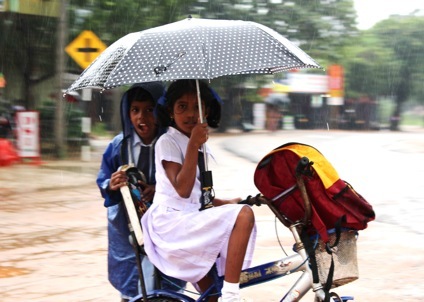 Educate Lanka extended its reach to the war-ravaged North in 2013, starting from Omanthai, Vavuniya. Driven by the understanding that education is a fundamental human right, we initiated Educate Lanka as a means to provide that opportunity to students who would otherwise not be able to afford a quality education. By developing a peer-to-peer crowd-funding model, we enabled a platform for individual philanthropists, mainly from the extensive Diaspora community around the world, to give those students an opportunity with simple $10-$25 monthly scholarships, through which 100 percent of their funds reach the students. By committing to fund students through the completion of their higher education, and by providing on the ground mentoring through our community leaders, we ensure that students are given access to and are able to gain a quality education. Every month for the past five years, we have heard stories on how our efforts are making a lasting difference in someone else's life. These stories from real people are the reason for our continued passion and drive to keep pushing our limits and overcome challenges to serve those who deserve a better future. One of Educate Lanka's very first students, Sayuri, provides such an example that inspires us to continue. When Sayuri was chosen by Educate Lanka in 2007 as a grade 11 student, her father had passed away, and her mother, the only income earner in the family, was struggling to make ends meet and provide for Sayuri's education. Today, in her fifth consecutive year of Educate Lanka scholarships, Sayuri writes enthusiastically to her sponsor: "The scholarship you have conferred upon me has been very beneficial... I was selected to pursue my higher education at the University of Sabaragamuwa. [My] journey would not have been a success without your support. Let me and my mother wholeheartedly and ardently say thank you for this precious opportunity you have given me." The greatest inspiration is witnessing the impact of our efforts on another person's life. Since our inception, operating on a voluntary basis, we have provided scholarships to nearly 400 students similar to Rashmi, Renuga, and Sayrui, valuing approximately Rs. 18 million (US $150,000). Among these students, almost 200 are females. It has been said that "when you educate a woman, you educate a generation," and we could not agree more when we look at our own impact in Sri Lanka. Building on our track record, we are now focusing more than ever before to extend Educate Lanka's efforts to many more deserving lives. We are committed to building the next generation of leaders from underprivileged backgrounds not only in Sri Lanka, but also in other countries that could benefit by replicating our model. This post is part of a series produced by The Huffington Post and IGNITEgood in recognition of International Women's Day, on March 8.